I can't remember what time I woke up in Finger Lake, maybe around eight am. In the lodge now were Roberto and Eric Wilmot the French skier both of whom had arrived a few hours earlier. They were up and getting ready, Roberto was suffering badly from a swollen ankle, it wasn't looking good for him. Finger Lake was food drop number one and I found my blue plastic sack up against the wall. I sliced it open and took out the cardboard box inside. The box held more of the same food that I had been cramming for the last couple of days, including some Shitake mushroom pate and oatcakes, a small luxury which went down well. I ordered a breakfast of hash browns and eggs and then started to replenish my bar bag with calories and repack for the ride to Puntilla. Much to our surprise we had heard that John Stamstad had scratched due to injury and it was with interest that we discussed what the contents of his food drop might be, the pop tarts and twinkies that he had once mentioned in an interview made us curious. It was with much disappointment that we discovered he had pretty much the same stuff as every other racer. I left with Carl at 10:45am, Eric and Roberto had left a full hour and a half earlier, we had been overtaken and now lay in fourth and fifth positions. The trail resumed from outside the lodge and immediately went into a steep downhill which I failed to ride with any degree of skill. At the bottom it went around the edge of a lake and I began to ride well, the trail was firm and we followed the three tell tale tracks of the sled being towed by Eric's snow machine. The trail went on like this for a mile or so and then we came upon the Iditarod trail maintenance crew who were making good the trail for the dog sled race starting the following weekend. I stopped and had a chat for ten or so minutes and listened to the crewman tell me how good the trail should be from here seeing as how they had worked on it. This was just about the best news you could get and it was with eager anticipation I left and immediately sank into a couple of inches of soft snow. And that's how it continued for several miles, on and off the bike, pushing and riding, a great trail and been softened up by the trail crew! I can't remember a great deal about this section. It coursed through the trees with some flowing singletrack and just before half way dropped away in three steep steps and deposited us at the bottom of the Happy River Gorge. We made our way along a short section of lake and then started to climb the equivalent of what we had descended, it was a very long hard push. Once on the top the trail flowed again and it became enjoyable riding. Progress was being made. This section soon opened out onto a fairly large lake and about half way down the lake was a small sign pointing to the bank, it said something like 'hot coffee and a fire for Idita racers'. Without hesitation we both made the diversion thinking that maybe this was another Red Bull type treat on the trail. We were wrong about the Red Bull but it was a treat. 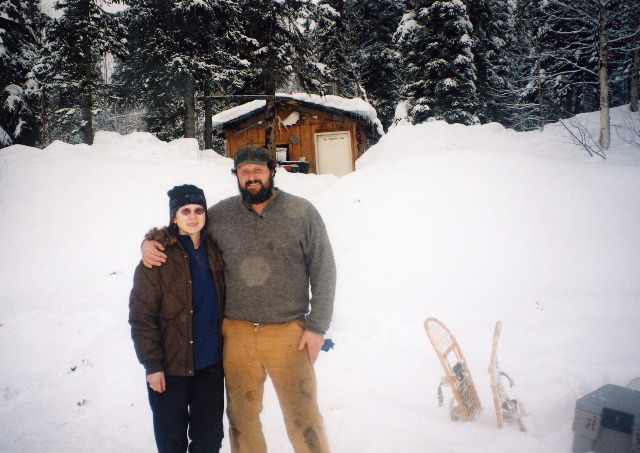 On the edge of the lake by a small cabin we were greeted by a couple, Mike and Ingrid, who came down to meet us. Invited up to the cabin we sat outside next to a small fire over which hung the coffee pot. 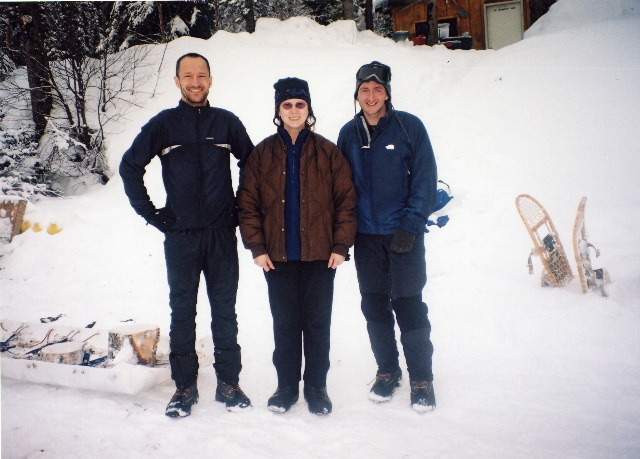 The story was that they came out to their cabin for a couple of months each winter to spend time chopping wood, chilling out and watching the Iditarod race go through. They also knew about our race and said they looked forward to meeting the racers each year. They had spotted one biker earlier on, Basinger, head down and didn't even wave or look across to the cabin. Roberto had passed without stopping but had waved. Us stopping made me feel a bit guilty but 20 minutes over several days wasn't going to make a huge difference, anyway we topped up with fresh spring water which saved a possible snow melting stop and a hot coffee went a long way to lift the spirits. We were told to watch out for Lynx tracks, footprints in a straight line and they had spotted wolverine tracks a few days earlier. We were unlikely to see a wolverine as they were fairly rare and kept themselves to themselves, like most of the wildlife here. Moving on we followed more singletrack through the trees, climbing and descending, generally having a good time as the sun disappeared around 6 o'clock. In the moonlight we could now make out the outline of mountains, new terrain. Sometimes it was frustrating when travelling at night not to be able to make out the landscape, at other times when on the river the opaqueness of the night disguised the monotony. Carl and I reached Puntilla without incident around 9pm to the applause of several people gathered outside the lodge, they had seen our headlamps some way off down the lake. We were not to stay at the lodge but in a small warm cabin with a bunk and couple of beds. We were expecting to see one of Bills checkers here but instead Kathi came out to meet us. She had been with Bill on the snow machine keeping ahead of the leader, however due to bad weather the checker had not been able to fly in so Kathi was hanging back. 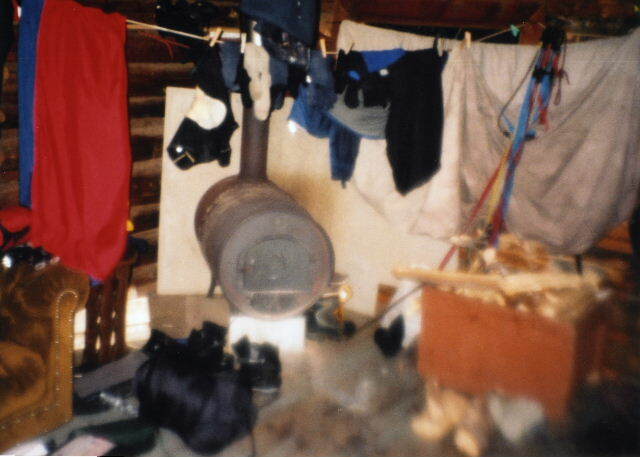 Inside the cabin it was the usual routine of stripping off and drying clothes - they were wet from sweat more than anything else and it was socks and boots that needed drying most. I had developed a small blister on the inside of each heel which didn't really bother me but I paid attention to each one and applied a protective layer of Compeed, a second skin, to make sure it didn't get worse. In the cabin were Peter Basinger who was asleep in the back room, Roberto who was flopped on the lower bunk and Eric who was getting ready to go, his feet were in a poor state and would get worse. As we sat down and ate Peter also made ready to leave. From here the trail lead over Rainy Pass and from what I had read was not to be attempted by rookies at night or in foul weather. With that in mind Carl and I were content to get some sleep and leave early. Eric left at 10:45pm, Peter at 11:15pm and Roberto at 3:45am. We were up at 6am and out by 7. Meanwhile Tim Hewitt had rolled into the checkpoint and was getting his head down for an hour.